From Lake George, to the St. Lawrence Seaway, to the pristine waters of Lake Champlain, and all of the beautiful mountains and maple trees that run between — our district is home to many ecological treasures. Sadly, many of these natural wonders have fallen under siege to invasive species that threaten the health and beauty of our natural habitats. When our natural habitats become overrun by species that are not native to these areas, they can damage the environment, pose health risks and even hurt our local economy. Our environment is our lifeblood in Upstate New York, and we must protect it from these predators to help boost our economy and to ensure we protect our environment for future generations. This is why, on February 5th, I was proud to join with stakeholders who have been working tirelessly on this issue across our district and across New York State at an Invasive Species Summit in Clayton. Attendees included — Save the River, The Fund for Lake George, and representatives from our local and state government as well as officials from the Canadian government, who have been working tirelessly to stop the spread of invasive species and mitigate the damage already done. Together we explored best practices and information sharing, as well as ideas for working on innovative new solutions to stop this epidemic. One of the most important things we can do as a community is work together to ensure that our friends and neighbors have the information needed to identify these invasive predators. With this in mind, I wanted to share three common invasive species that threaten our North Country habitats. What It Is: Zebra Mussels have been found in numerous bodies of water in our district, including Lake Champlain and the St. Lawrence River. These aquatic invaders disrupt natural food chains in our bodies of water, harm native species, can disrupt water treatment plants and even risk human exposure to pollutants. What You Can Do: Humans are the main cause of the proliferation of zebra mussels. Zebra mussels like to hitch a ride on boats when they’re transferred from one body of water to another. 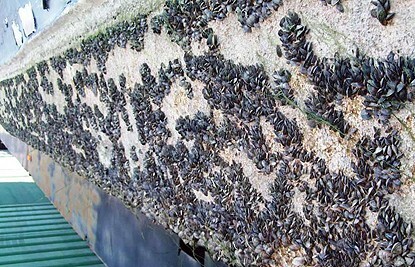 It’s important to make sure to thoroughly clean your boat each time it leaves the water to ensure these invasive mussels are removed and that you are not spreading them to your next location. The New York State Department of Environmental Conservation has a great resource on tips and techniques for cleaning boats to combat these aquatic invasive species. 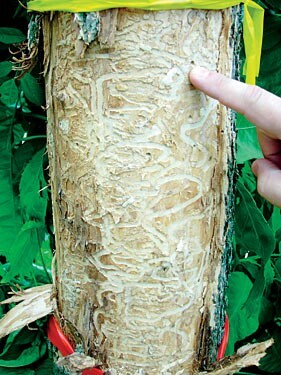 What it is: The Emerald Ash Borer is an Asian beetle that threatens millions of Ash trees across the United States. This insect feasts on the trees and leaves rendering them unable to transport water and nutrients, killing hundreds of millions of ash trees across North America and costing local governments, property owners and businesses hundreds of millions of dollars. The emerald ash borer is responsible for the destruction of over 50 million ash trees in the U.S. since its discovery in Michigan. What You Can Do: One of the most common ways people help spread this invasive insect is by transporting firewood from one location to another. 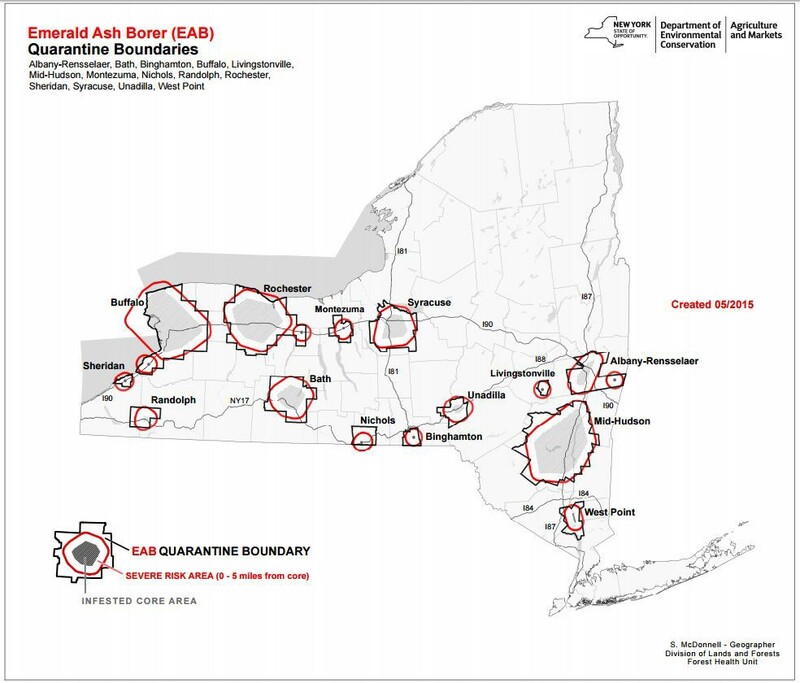 As you can see in the map below, infestations of the invasive emerald ash borer are prominent in areas of New York State. If you transport wood from one of these infested areas, you can unknowingly spread this infestation to unaffected areas. 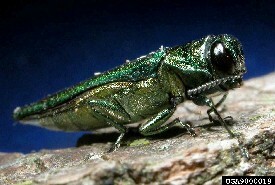 Help stop the spread of the Emerald Ash Borer to the North Country by buying your firewood locally! What it is: Hogweed is a noxious weed that can grow to 14 feet and can cause skin irritation, blistering, scarring and even blindness. Hogweed is prevalent in Lewis and Essex Counties in the North Country. 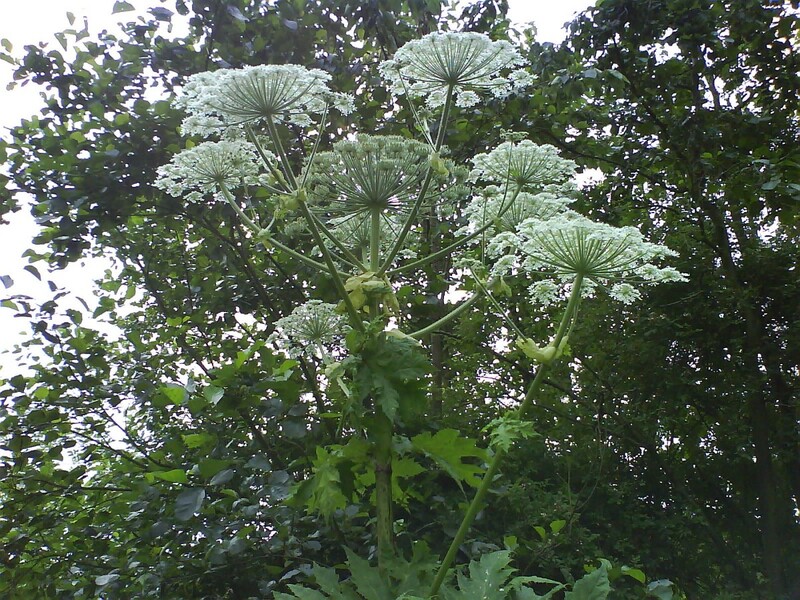 What You Can Do: If you come into contact with Hogweed, do not touch it! You will want to make a positive identification of the plant and contact the New York State Department of Environmental Conservation so that it can be contained and removed. These are just a few invasive species that are affecting our North Country habitats and that I am working with stakeholders from across the district and region to help control. For more information on what types of invasive species are found throughout New York State, here is an interactive map. It’s incumbent on all of us to do what we can to protect our environment, and by working together at the federal, state and local levels, I know we can preserve our natural treasures for generations to come. I will continue to be a leading voice in Congress on this issue, and will maintain the ongoing efforts with these organizations to develop policy and to secure the funding necessary to prevent, contain and eradicate this threat to our delicate ecosystem. Official Medium Account for Congresswoman Elise Stefanik, proudly representing New York's 21st District.